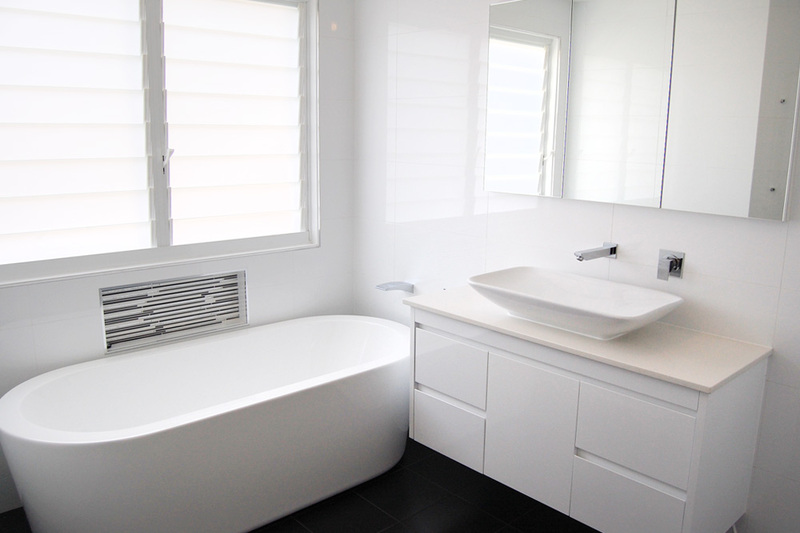 Bensville | Custom Bathrooms | Central Coast bathroom renovations – Modern bathroom ideas. Custom Bathrooms have transformed this bathroom into a beautiful sanctuary that perfectly suits the needs of our client. This family bathroom has been designed with elegance and functionality in mind. The custom made in built shaving cabinets and contrasting wall niches have provided clever and stylish storage solutions. Situated under a new louver window, the freestanding bath is a feature of this space, inviting the owners to relax and unwind in their beautiful new Custom Bathroom.